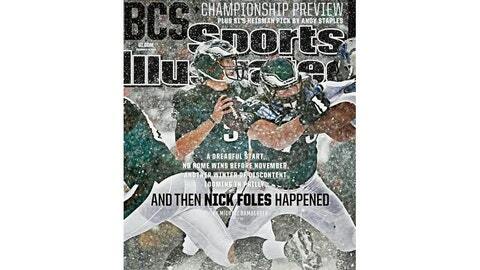 Is SI cover jinx the only thing that can stop Nick Foles? He’s 7-1 as a starter this season, throwing for 20 TDs with only one pick, has a 7-TD game that got his jersey sent to the Hall of Fame and boasts the best passer rating (120.0) in the league — ahead of Peyton Manning (114.5), Russell Wilson (106.5), Tony Romo (98.3) and Tom Brady (88.3). Anyone who claims he shouldn’t be taken seriously has either been sleeping or is a Cowboys fan. Remember how Brady became Brady? Or Aaron Rodgers? Similar situations. When Foles was named the starter, the Eagles were 3-5 and their season was pretty much getting written up as it had for the past couple years: All the offensive power in the world without any consistency. Well … those 3-5 Eagles are now 8-5 at the top of the NFC East and it’s hard to call them a fluke. It’s even harder to call Foles a fluke. So why shouldn’t he be on the cover of Sports Illustrated? If anybody is deserving of it at this time of the year, it’s Foles — for his modesty alone. Player of the week twice, NFC player of the month … the list of accolades goes on and he kind of just says there’s more work to be done with his game. If that’s not the type of leadership spirit you need in a locker room, what is? When Foles found out he was on the cover in one of the most iconic scenes you could ask for, he dismissed the hype. "I just zone it out," Foles said Wednesday when asked at his locker. Foles is doing big things in Philly for an Eagles team that constantly starts the season with hype and Super Bowl whispers, but then ends up being doomed for a mediocre return on investment. The last Eagle to grace Sports Illustrated? Nnamdi Asomugha … remember him? The corner who was "arguably" the best lock-down defender next to Darrelle Revis? Asomugha was on the cover during the 2011 preseason, and some say he fell victim to the SI cover jinx. With Foles though, since he’s not feeding into any of the hype, that just doesn’t seem like it will affect him. And plus, Asomugha posed for the cover, and Foles didn’t … if that matters. Foles won’t even fully take credit for what he’s been able to do. His teammates are never left out. "It’s a great team sport. You can’t do it forever," he told CSNPhilly.com. "When I look back I’ll always remember the guys I played with. This (past) weekend, I was very fortunate to have some of my high school teammates that were in the area come to the game. It was fun just seeing them and talking back about our old times, when we were playing at Chaparral Stadium in Austin, Texas. That’s what it’s all about. It’s about those memories. "Obviously, you want to win the Super Bowl and all that, but it’s the people you do it with. That’s how I look at it." It just seems like perfect timing for Foles to be the cover boy. What do you think?